I adore spring tulips. 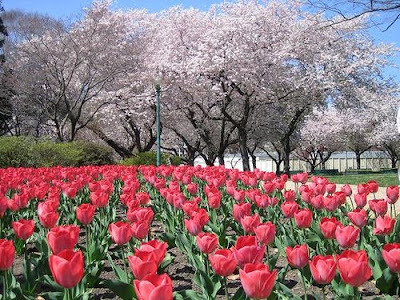 Growing up and going to school in Washington, DC the meridians of the nation's capitol would be filled with riotous tulips fat and happy in the day's bright sunshine, closed and elegant by evening's chill. This was a very simple penny rug to make. 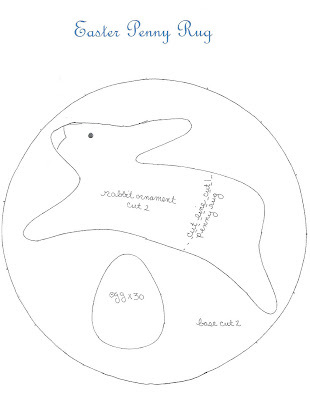 I have included the full size pattern of the rabbit as he can be an ornament. Directions: Inexpensive craft felt works wonderfully for this project as an array of colors can be found this time of year. 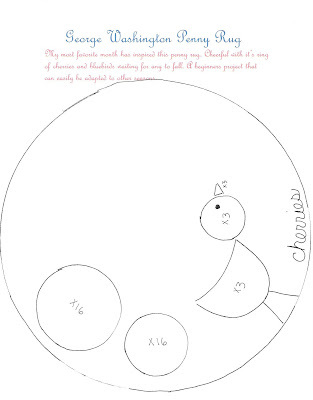 The circle base will just fit onto the 9 1/2 X 8" pieces found at your craft stores. Button stitch rabbit in place, his nose, and tack on his beaded eye. I used pencil to write out my "Chocolate Rabbit". Three strands of floss will just cover your lines; so don't at all worry about them. Outline stitch. Button stitch two circle bases together three strands floss. Eggs: I used matching colored thread, three strands. Eggs are attached with three knot stitches at the base of egg hiding thread between layers. Watch your spacing! 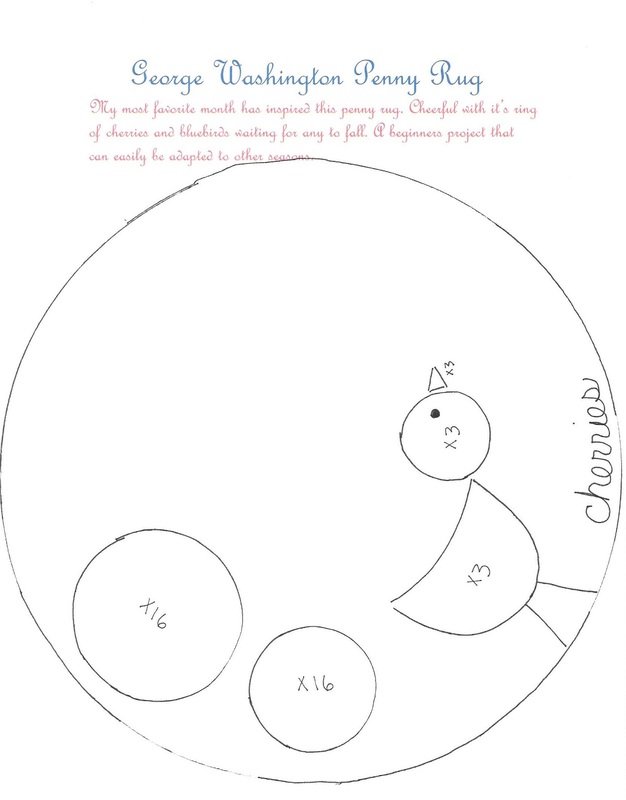 There should be a small space between each egg. Ironing: I just love watching the steam work it's magic on the felt to meld the pieces into one. I begin from the back lightly holding iron in each spot for seconds. An even lighter pressing on the front. Don't let your piece get too flat! Can you just picture my school drive past the Jefferson Memorial as the cherry blossoms fell like snow in the first of spring's breezes. I would roll down my window and let my palm sail the air currents of pink petals. These were my favorite days. I love the month of February. Growing up just a stone's trow away from Mt. Vernon; and our dear family friends actually residing in Fort Washington, I have always loved George Washington's birthday, February 22nd. Endless summer days spent gazing across the Potomac River from the embankments of the fort, I would picture lawn parties under the massive willows and women eating tiny cucumber sandwiches. My mother held her art shows on the covered flagstone porch of the fort's main dwelling. So powerful was hearing the tale of George as a child cutting down his father's cherry tree, that I decided on the spot never to lie. A prized possession is my little hatchet cookie cutter. The step I enjoy most in making penny rugs is ironing them. Watching the pieces "felt" together is magical! Penny Rug made for George Washington's birthday, it seems only right that Chocolate Cherry Cookies be served! Beat: 3 sticks butter, micro 30 sec, 2 eggs, 1 1/2c brown sugar, 1c white sugar, 1T vanilla, 1c cake flour, 1/2t baking soda, 1/2t baking powder. I do wish you a wonderful George Washington's Birthday! Colonels and Generals and Fighter Pilots, Oh My! Working as a Kelly Girl in my Newlywed Days living on base at Davis Monthan AFB in Tuscon, Arizona, I was assigned to the newly established DEER Enlistment Program to register all active personnel and their dependents with identification cards. Along with a dozen other girls, we sat at classroom desks with our Selectric typewriters and endless forms to be typed without error. Eight hours a day handsome fighter pilots in training waited helplessly in line for one of us to be available. If they did not have proper documentation, it was our job to leave our desks and enter the secured file department filled with more military men in their handsome uniforms. These were heady days for a 21 year old with her honeymoon wardrobe to be admired. I most loved about this job the opportunity to work so closely with other secretaries who seemed so glamorous and worldly to me. One had fiery red hair and had been a Las Vegas show girl in the past. One had been an English War Bride. One was a most beautiful Mexican girl who was dangerously flirting with the base Chaplin. I think the overload of cologne in the air affected everyone! Each day for lunch we were taken by bus to the NCO Club. White linen table cloths, china and silver, it all seemed too good to be true. Salads the order of the day, iced tea with lemon. Conversation always the same. "I can't believe she's going to go ahead and marry him after what he did to her!" Indignant agreement, "Don't forget he kidnapped her, too!" "Did you hear what the Doctor had to say about it all?" another would add to the conversation. Suspiciously quiet day after day, it was finally asked why I didn't participate in the conversation. I replied, "I'm so sorry but I don't know anyone with such dramatic lives as you all seem to know. I have never known anyone who was murdered or kidnapped." "Oh, Elizabeth honey. We aren't talking about real people. Don't you know who Luke and Laura are?"